Step 1 Using a mortar and pestle, grind the garlic and one-eighth teaspoon salt to a smooth paste. Add the pine nuts and grind until smooth. Step 2 Add a handful of dandelion greens and a sprinkling of salt, grinding to break the leaves down to a pulp, until all the dandelion greens and salt are incorporated (this can take up to 30 minutes). Step 3Add the cheeses and olive oil, grinding and stirring to combine. Taste, adjusting the cheese and seasoning if desired. Add a touch of lemon juice to brighten the flavors if you like. (The pesto can also be made in a food processor or blender, though the recipe will require an additional clove or more of garlic). In Recipes-list.com we have selected the most viewed recipes from category - Sauces and condiments Vegetarian . Enjoy the best recipes specially selected for you! 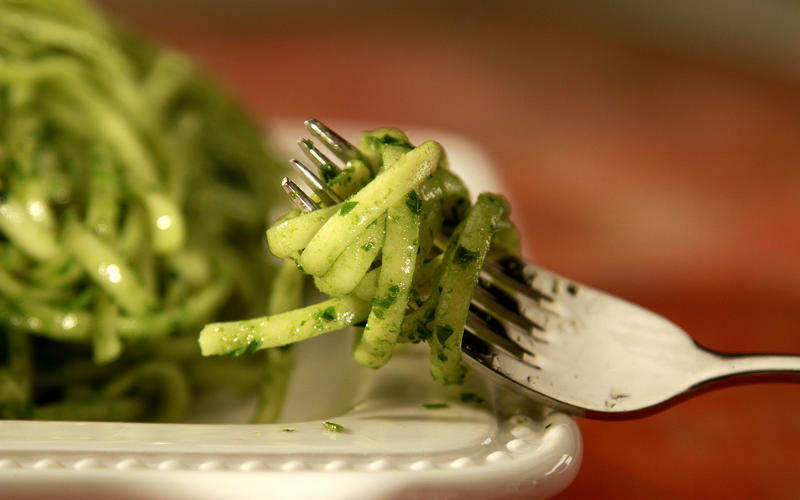 Dandelion pesto is the right choice that will satisfy all your claims.